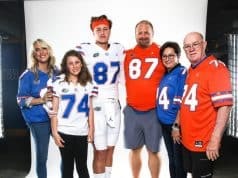 DE Ben Martin can see himself fitting in at the University of Florida after a four day visit. Ben Martin stands 6-5 and weighs in at 230 pounds. His specialty is decapitating opposing quarterbacks and making weary offensive linemen look silly. The Cincinnati (OH) superstar made his presence known in Gainesville at Friday Night Lights. Even though he didn’t participate, everyone knew Mr. Martin was in attendance. He came away impressed with the University of Florida. As a junior Martin had 28 solo tackles, 42 assists, 10 sacks, 15 tackles for loss, three batted down passes, and four caused fumbles in 2005. Last weekend he took it easy in Gainesville. The Gators hosted the second annual Friday Night Lights. It is a camp where they have managed to get a great number of the elite players in America to show up and take part. Some like Martin don’t participate, but he almost couldn’t resist. “Friday Night Lights was tight,” he said. “I almost wanted to get out there. I had camp this week and coaches didn’t want me to get hurt. I saw a lot of talent out there. That quarterback from Georgia (Cameron Newton) was real good. As many recruits do, Martin made a new good friend at the camp. Defensive end Duke Lemmens is looking hard at Florida and told us last week he would love for him and Martin to end up at the same school. He also met up with two very popular prospects in the 2007 recruiting class. 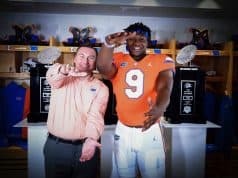 Unknown to most it seems that Martin has been quite busy talking to the coaches at Florida. He was here for four days and almost knew the campus well enough from all of his conversations with Florida Head Coach Urban Meyer. What are his thoughts on Florida after visiting for four days? “I can really see myself fitting in down there,” he said. Florida joins Ohio State, Notre Dame, Tennessee, and Cincinnati at the top of his current list, but He is insistent on not cutting it off at that point. He had a few things to say about the four other schools he named. Martin also knows a few things that will propel him towards the school he finally decides on. One common theme is the character of the people at the institution. Already larger as a high schooler than one former Gator he is drawing comparisons to. Martin says he patterns his game after one football player that is absolutely relentless on the field. “People tell me I play like Jevon Kearse, but I try to emulate Dwight Freeney,” he said. B- Mart, as his teammates call him, remembers one evening that would make Kearse or Freeney proud. It seems that one particular player from a local nationally ranked team decided he was going to run his mouth at the wrong time to Mr. Martin. Ben Martin is attacking the recruiting process like he does opposing quarterbacks. He knows what he is doing and relentless in the pursuit of what he wants. Schools have lined up to lure the young talent in. Knowing Martin he will come out on top in the end and make the right move.